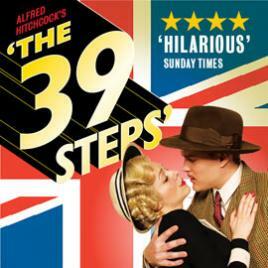 So the show we went to see to accompany our meal at Inamo as part of the LastMinute.com £24 deal was The 39 Steps. Probably not something I would have raced to see above others if it hadn’t been part of the package but I’m very glad that I have seen it. I vaguely remembered reading the book at school for English class (90% of the books we studied were by Scottish authors) but I recalled very little of the story. Now I’ve never seen Hitchcock’s movie version of this classic spy thriller but I believe that it is quite dark whereas this stage version is the exact opposite. Funny and lighthearted (well as much as you can be in a play about murder) it’s comprised of a cast of just four actors whom, all bar the main actor, play multiple roles throughout the show. It’s a really incredible feat of co-ordination and talent and the time flies by because of how fast paced it was. Sadly it wasn’t quite fast enough to prevent my bum from getting numb as the seats aren’t the most comfortable. I was also pretty disappointed with our seats. We were front row in the upper circle which was more than amazing for the price that we paid but almost the entire dress circle and half of the stalls were empty which seemed like a bit of a waste. It’s very difficult to know how to rate this show price wise as there are a multitude of deals available especially through LoveTheatre.com (no I’m not being paid by them I promise) like the top price stalls ticket with complimentary glass of prosecco for just £28.50 but if you weren’t aware of these and paid full price (£50 + booking free) direct from the theatre I think you would most likely be disappointed.